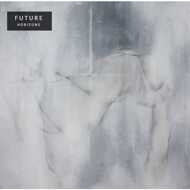 "Future were one of the many bands on ‘The Reverb Conspiracy Vol. 3‘ that captivated and left me wanting to hear more. Their track ‘Side Effects’, I described as, “an exquisite existential exercise in “sharp guitar riffs, cold melodies and fractured drums”” – as befits their “Cold Wave” self-classification. Thankfully the wait has not been too long, as the Paris based band have just released their debut album ‘Horizons’ on the Requiem Pour Un Twister label."